September 2018 saw the loss of yet another name from rock music history, as Marty Balin died at age 76. Marty Balin was one of the founding members of Jefferson Airplane and also sang with its offshoot, Jefferson Starship. But it was his solo career that has become forgotten by radio now. I don’t know, just Janis [Joplin]’s death. That struck me. It was dark times. Everybody was doing so much drugs and I couldn’t even talk to the band. I was into yoga at the time. I’d given up drinking and I was into totally different area, health foods and getting back to the streets, working with the American Indians. It was getting strange for me. Cocaine was a big deal in those days and I wasn’t a cokie and I couldn’t talk with everybody who had an answer for every…thing, rationalizing everything that happened. I thought it made the music really tight and constrictive and ruined it. So after Janis died, I thought, I’m not gonna go onstage and play that kind of music; I don’t like cocaine. Following his time in Jefferson Airplane, Marty Balin did some producing and managing work and joined a rather short-lived band before Paul Kantner asked him to write a song for Jefferson Starship, which had spun off from the broken-up Jefferson Airplane. Mr. Balin ended up contributing vocals as well as lyrics, and by the next year was a permanent member of the group. The mid-70s were quite good for Jefferson Starship and for Marty Balin, who sang lead on several of the group’s biggest hits of that era, including “Miracles”, “With Your Love”, and “Runaway”. Following 1978’s Earth, Mr. Balin left for a solo career. His last appearance with the group may well have been the group’s most infamous, as they appeared in the Star Wars Holiday Special* as the holographic band. What a way to go. 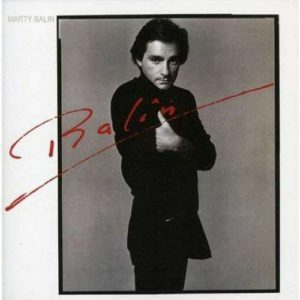 For whatever reason, it took until May 1981 (by which time Jefferson Starship had released two more albums without him) for Marty Balin to release his first album, called, fittingly enough, Balin. The first single from Balin, “Hearts”, was not written by Mr. Balin; instead, it was written by Jesse Barish, who had written for Jefferson Starship. A fairly straightforward song about the singer missing his former love and thinking of what he could have done differently, “Hearts” worked in the mishmash of genres that was pop music in 1981. “Hearts” entered Billboard’s Hot 100 at #86 for the week ending May 23, 1981 (chart) and rocketed into the top 40 quickly before slowing its ascent and finally peaking at #8 for the week ending August 8 (chart | magazine). In all, it lasted for an fairly impressive (for the time) 21 weeks on the chart, and its performance was enough for Billboard to rank it #41 in its year-end chart for 1981 (magazine). However, Marty Balin’s first solo hit turned out to be his biggest as well. A follow-up single, “Atlanta Lady (Something About Your Love)” barely made the top 30. Only one single from his next album cracked the Hot 100 at all; following that, Marty Balin never charted a solo single again, though he did continue to record after that. He also joined the KBC Band with his old bandmate, Paul Kantner, and he did stints with both a reformed Jefferson Airplane and a reformed Jefferson Starship. Marty’s fans describe him as having had a substantial impact for the better of the world: “One of the greatest voices of all time, a writer of songs that will never fade, and founder of the quintessential San Francisco band of the sixties.” His music is known for being the soundtrack to all of life’s monumental moments. While Marty Balin’s best known hits with Jefferson Starship are mainstays on classic hits and/or classic rock radio stations, “Hearts” has fallen by the wayside. The last I heard it on any station was on a soft AC station in Idaho in 2003. It deserves better. * I’d love to link to it, but as most people know, it’s never been officially released, and most involved would love to wish it away. Whether that number included the members of Jefferson Starship, I don’t know. Note: this post contains affiliate links. View my affiliate link disclaimer here.